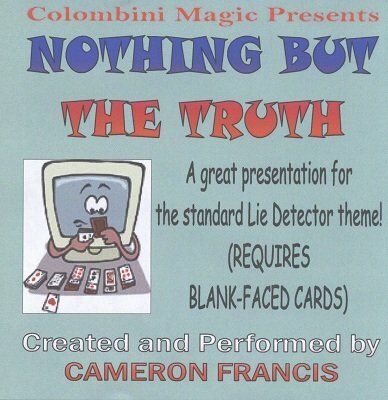 A great presentation for the standard Lie Detector theme where you reveal, using four cards, if the spectator tells the truth or lies and at the end the four cards change into four duplicates of the selections. You will love it! Can be done in any language. I've always thought the lie detector plot (from experience using it) was a commercial plot, because it allows fun interaction from the spectator and seems inexplicable because of their own input. This is one of several packet trick versions of the plot available and I really like it and have used it. One day I'll make myself up a jumbo set. If there is a downside to this version it would be the lack of variety with the selection, but I doubt that will stop you using it, it didn't me. This is a direct solution to the plot you'll have fun using. Worth every penny.